According to the National Register of Historic Places nomination form, this is said to have been built as a one-story cottage circa 1848, though a discussion on Old House Dreams suggests that there is no evidence of the original incarnation; it was enlarged and remodeled to its present appearance around 1885, most certainly by the same builder who remodeled the James K. Daniel house on Rees Park. 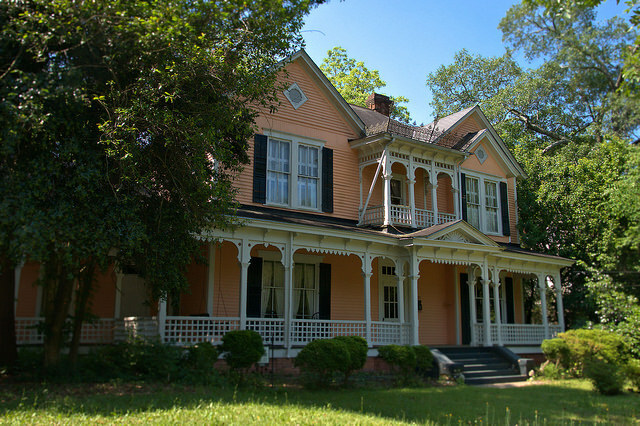 Like other houses in Americus, it is heavily influenced by the Queen Anne and Italianate styles. I wonder if Americus has a tour of historic homes during the year. I’ve grown so weary of the hoards that descend on Savannah each year and need a new destination. I believe they do…and I hear you on the Savannah-weariness. It’s really got too many problems, from rampant crime to Atlanta-style traffic!